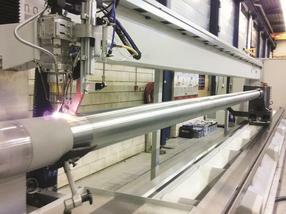 © Fraunhofer ILT, Aachen / Hornet Laser Cladding B.V., Lexmond, NL. World premiere: EHLA system for Laser Material Deposition of piston rods having a length of up to ten meters. Because of the upcoming admission restriction on coatings which are produced with hexavalent chromium, IHC Vremac Cylinders had long been searching for a fast and economical alternative to hard chrome plating. The Dutch company ultimately opted for the EHLA technique (extreme high-speed Laser Material Deposition), which was awarded the 2017 Joseph von Fraunhofer Prize in May. In the patented EHLA method, a laser beam melts the powder particles already above the melt pool. Because the particles no longer have to be heated and melted in the melt pool, process speeds can be accelerated from previous levels of between 0.5 and 2 meters per minute to as much as 500 meters per minute. EHLA can also reduce layer thickness: whereas the minimum thickness of layers used to be 500 micrometers, layers as thin as 25-250 micrometers can now be achieved cost-effectively. Moreover, the layers are smoother, with roughness reduced to a tenth of typical values for Laser Material Deposition. 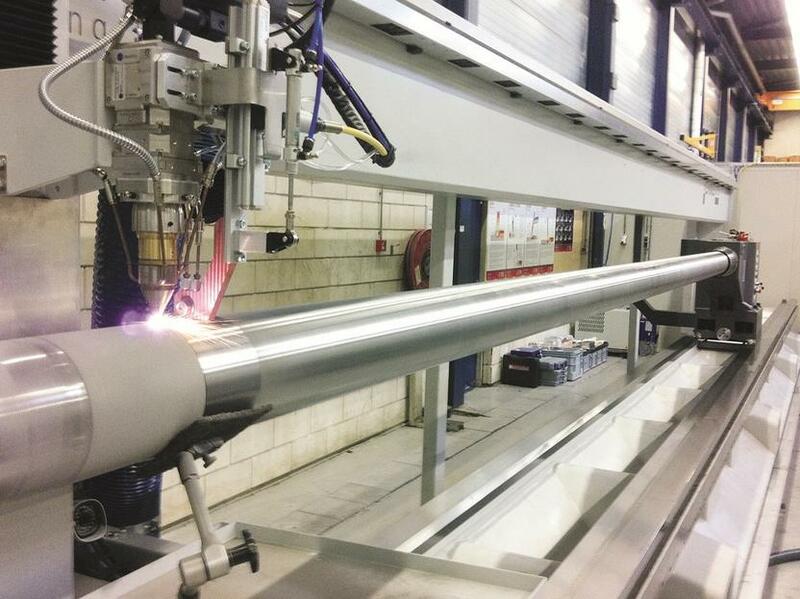 The concept and the first industrial-standard system in Aachen impressed IHC Vremac Cylinders, so the company contracted Hornet Laser Cladding B.V. – a manufacturer of Laser Material Deposition systems in Lexmond, Netherlands – to build an EHLA system. “The advantage of using EHLA to coat rotationally symmetric parts is that the necessary components can be integrated into a lathe,” explains Thomas Schopphoven, head of the Productivity and System Technology team in the Laser Material Deposition group at Fraunhofer ILT, Aachen. It took them less than six months to procure and convert a lathe for the roughly 14-meter-long EHLA system, and thereafter install and commission it.